Raising butterflies from egg to adult is a rewarding and sometimes miraculous experience. Kids love to see the changes the critters undergo and it is a wonderful educational opportunity. They are fairly easy to take care of and are relatively low maintenance. Best of all by bringing caterpillars and eggs inside to raise you are increasing their chances of survival. And since the populations of butterflies in general is decreasing mostly due to habitat loss they can use all the help they can get. Butterflies are insects and like most insects (about 88%) they undergo complete metamorphosis. That means their bodies undergo drastic physical changes from one stage of life to the next. The butterfly has four stages of life. The first is the egg, next the larvae followed by the pupa and finally the adult. The egg of a butterfly is the first stage of life. Female butterflies lay their eggs on the leaves of the caterpillar host plant. The location and appearance of the eggs will vary from species to species. Some butterflies lay only one egg per plant others will lay several clustered together. Eggs are typically cylindrical, round or ovular. The egg stage typically lasts between 3 and 14 days, depending on the species. The larva of a butterfly is also known as a caterpillar. The caterpillar emerges from the egg and begins to eat. Caterpillars need to grow a substantial amount often increasing their size by 1000 times which is why caterpillars spend most of their time eating. 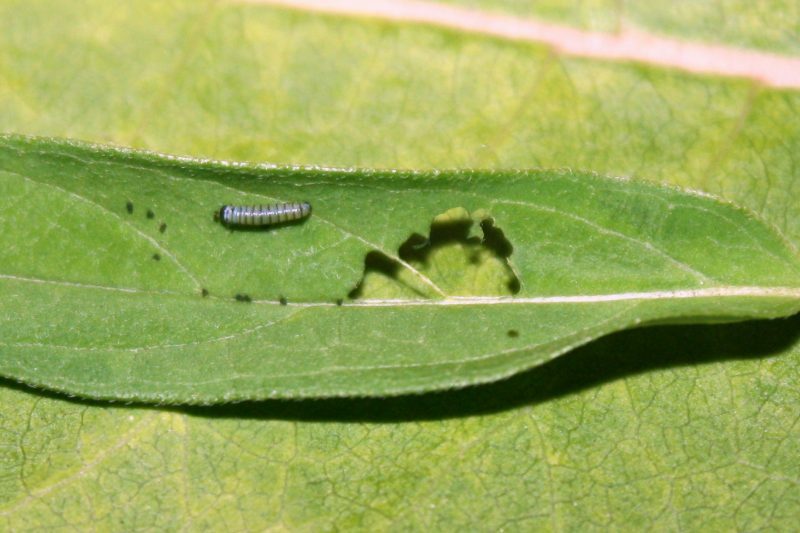 Caterpillar eat the leaves of their host plant which varies from species to species. 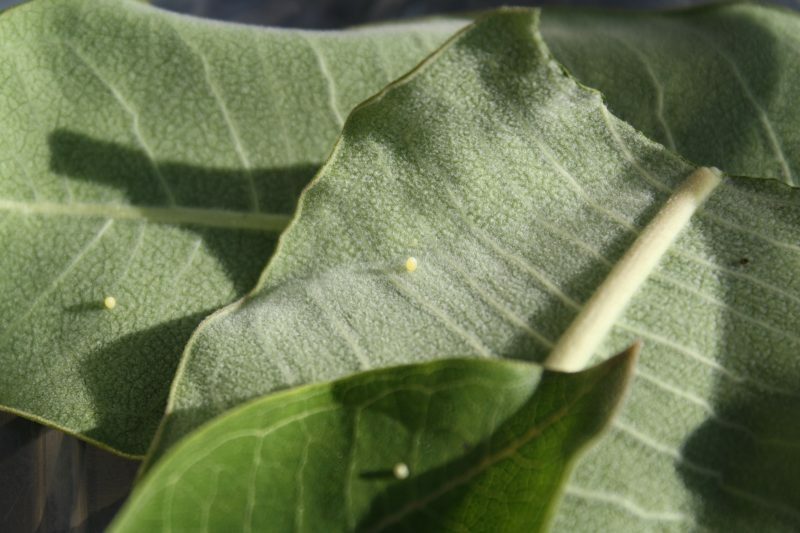 Some caterpillars, like the Monarch, feed only on one type of plant, milkweed in this case. 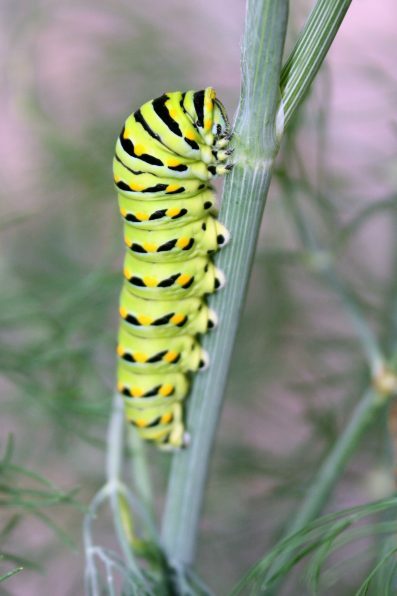 Other species, like the Black Swallowtail, can feed on several different plants such as parsley, dill, and fennel. As the caterpillar grows its exoskeleton does not stretch as it gets bigger. The caterpillar sheds its exoskeleton in a process called molting. Each stage between molts is called an instar and caterpillars grow through 5 instars. 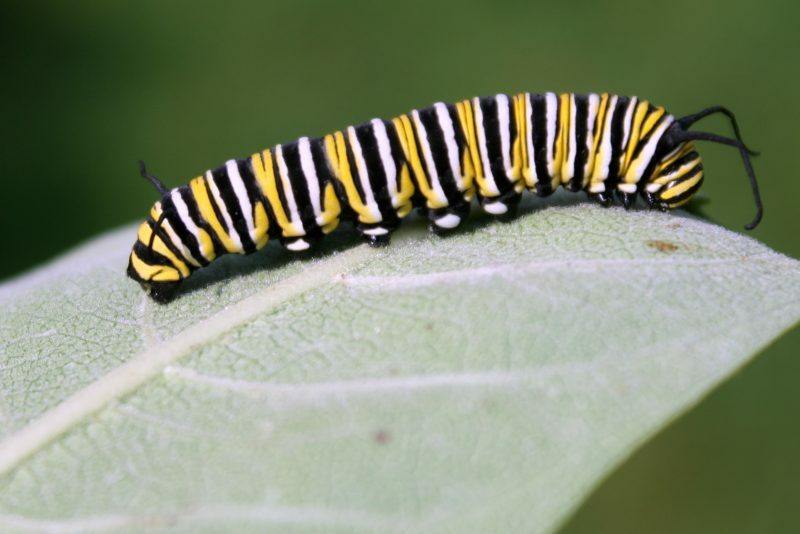 It takes about 2 weeks, typically, for a caterpillar to grow from the 1st instar to the 5th. Once the caterpillar reaches its 5th instar it will begin to search for a safe place to create its pupa. The pupa is also known as a chrysalis and is the vessel in which the caterpillar transforms into the butterfly. This can be on a twig, tree branch, tree bark, or lower leaves of a sturdy plant. The location of the pupa will vary between species. This is a very important stage and often the most vulnerable of the butterfly. As a result the pupa is often camouflaged to protect it from predators. The butterfly remains in the pupa stage around 2 weeks, but this will vary for different butterflies. Some species, for example, overwinter in their pupa. In which case they will remain in that stage for many months. The final stage of the life cycle is the adult butterfly. After the metamorphosis process is complete the adult will emerge from the pupa as a butterfly. When they first emerge their wings are wrinkled and wet. They hang from their pupa to pump blood into their wings from their abdomen. They often remain there for anywhere from 30 minutes to several hours to allow their wings to stretch and dry. After this time the butterfly is able to fly and begins to search for a mate to start the process all over. The best place to look for caterpillars and eggs is on the host plant of that butterfly. 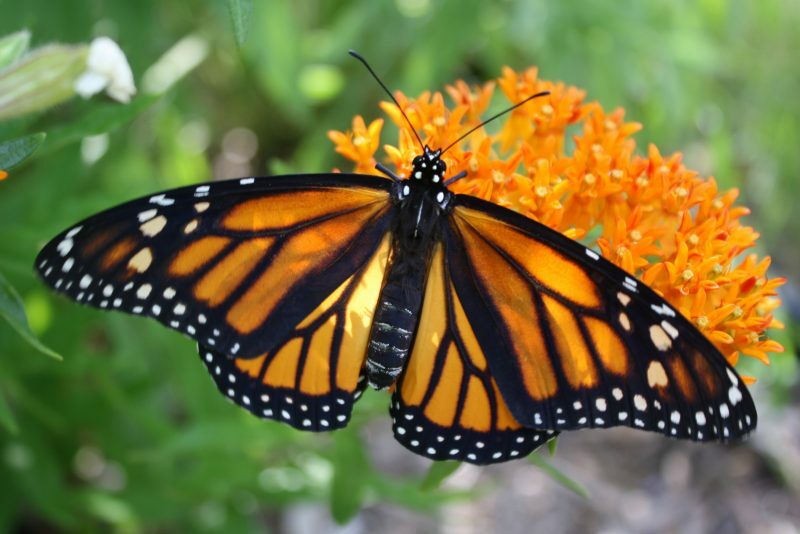 Host plants growing near nectar sources, such as a butterfly garden, are more likely to have caterpillars and eggs. 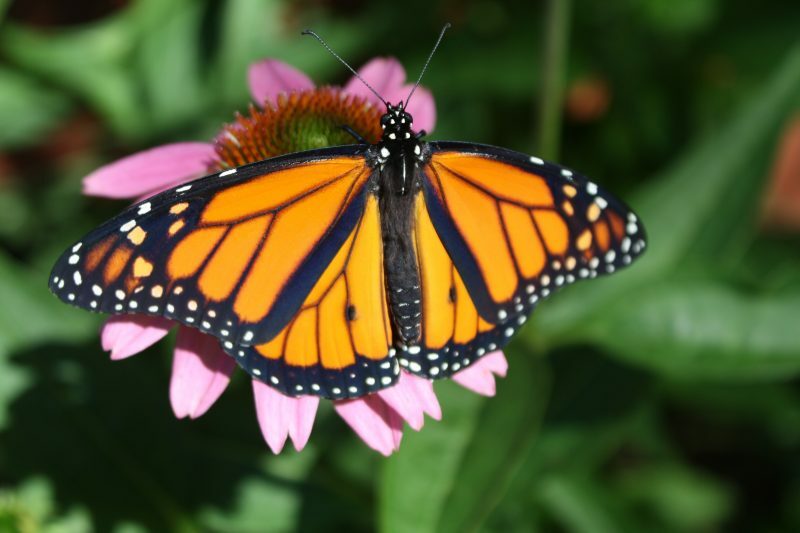 Determine which butterflies frequent your area and then you’ll know which plants to check. Each species of butterfly lays their eggs in different places on the host plant, but they are typically on the underside of the leaf near the top of the plant. Eggs are very small, about the head of a pin so unless you know what you are looking for they are hard to miss. The best clue is to look for the adult butterflies. Not only will that tell you that butterflies are active in your area, but it will also clue you in which specific host plants to check. 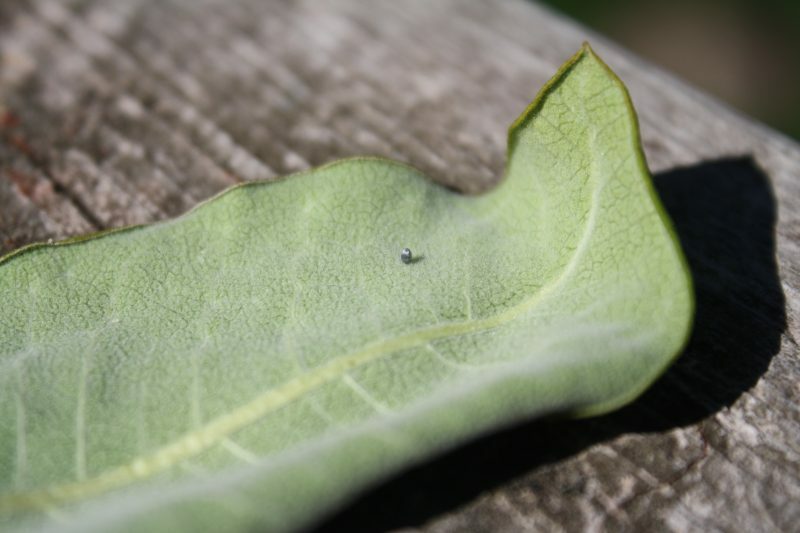 As the eggs are so small it may be easier to find caterpillars. Caterpillars will typically be on the leaves or stems of the plant. They can be on the top or bottoms of the leaves. Check the plant for signs of a caterpillar such as chew marks or frass. Alternatively, if you can’t find caterpillars there are kits available in which caterpillars and a food substrate are provided. These do not need any extra food or maintenance. 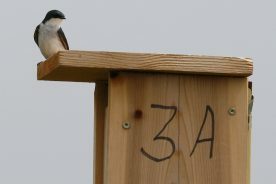 This is a very easy solution, although the hunt for eggs and caterpillars is sometimes half the fun. Once you find an egg or caterpillar it is important to raise them in an environment that is safe and healthy. Eggs can be placed in a sealable container, such as a plastic container that was used for lunch meat. Poke small holes in the lid for air circulation. Make sure the container is dry; moist conditions can lead to disease. Once the caterpillar hatches from the egg you will need to provide fresh leaves for it daily as well as clean the frass from the container. Place a dry paper towel or newspaper at the bottom of the container to help. Frass looks like small, round green or black pellets. They do not have an odor and are easy to clean. It is a good idea to only place one caterpillar per container as some caterpillars can be cannibalistic. When the caterpillar is in the 4th or 5th instar it will need to be placed in a larger container. Something tall like a quart-sized mason jar is sufficient. A mesh butterfly cage can also be used. Don’t place caterpillars in the mesh container when they are too small; they may try to escape through the mesh holes. Use a coffee filter as a lid for the Mason jar (secure it with a rubber band or jar band) to allow for air circulation. When the caterpillar is ready it will mostly likely pupate on the coffee filter. Sometimes they do pupate on the side of the jar. In either case it is fine to leave the pupa in the jar until the butterfly emerges. Be sure the butterfly has plenty of space to hang when it first emerges to allow for its wings to dry. 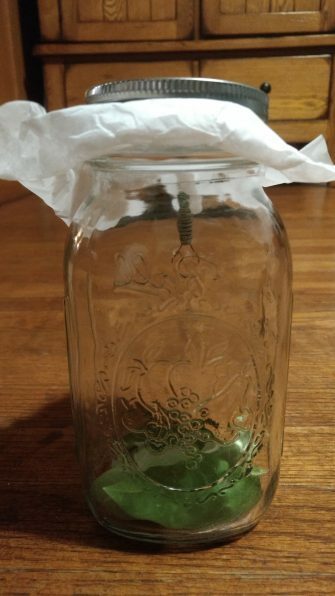 If you keep the pupa in the jar place a stick or mesh inside the jar to allow the butterfly something to climb on incase it falls from its pupa. Once the butterfly begins to flap its wings and is moving around the container, it is time to let it go. Take it outside and open the container near a tree or flowers. The butterfly may not fly out initially, but will eventually work its way out. Never pick a butterfly up by one wing. If you must lift the butterfly gently grasp the butterfly where its wings overlap so that you are holding all 4 wings at the same time. Do not pull at the wings. While the wings are grasped with one hand use your other hand to gently curl one finger under the head of the butterfly so that it may walk up your finger. You do not want to pull it from the side as you may rip off its legs. Once holding the butterfly gently place it on a flower. 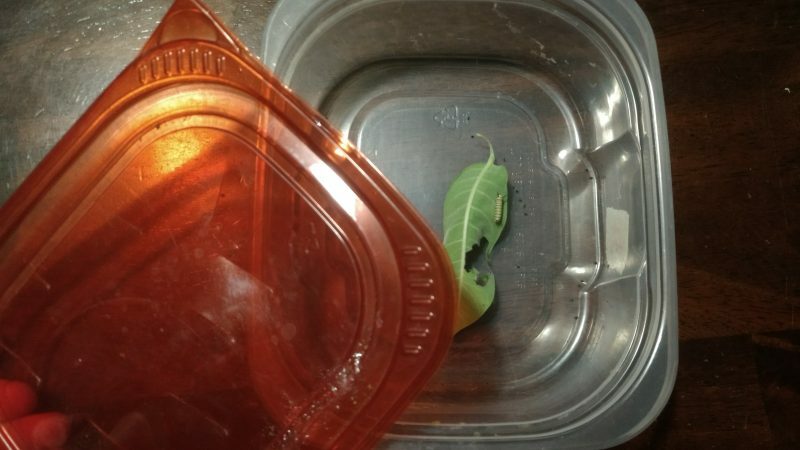 Caterpillars need fresh leaves and a clean container daily. They do not need water. If you do not have the host plant growing in your yard you can harvest leaves and store them in the refrigerator for several days. You may also take a cutting from the host plant and place the cutting in a vase of water. Be sure the vase is closed at the top so caterpillars can’t fall in and drown. Do not place your container in direct sunlight. It will be too hot for your caterpillars. They can be handled by humans, but it is generally safer to leave them alone. Lotions, soap and other residue on your hands may damage your caterpillars and in some cases may be fatal. If your caterpillar stops moving or eating for about a day it is probably molting. They are particularly sensitive during this time so it is best to not disturb or handle them. They may also stop eating and wander around the cage shortly before pupating.